Younis Sebaggala takes part in a service project. Common wisdom tells us that when you help someone else, you help yourself. But what does that mean? What does it mean to find yourself, or for that matter lose yourself? In the busy world we live in, we are becoming more and more isolated from our friends, neighbors, and family. I believe that by using our time and talents to help people, we can reverse that trend. I believe that there is value in being connected to other people, and the volunteers I meet professionally and every day through my Rotaract club continuously strengthen this belief. 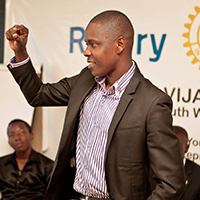 Younis Sebaggala talks about the importance of service during a Rotary meeting in Uganda. The happiness that I see radiating out of our volunteers when I meet them is beautiful. They have a glow from doing something that makes a difference in other people’s lives that you could never achieve by living only for yourself. Connecting with others is ultimately how we learn about who we really are ourselves, it’s what guides us to find ourselves. Volunteering to benefit the people around you, in my mind, is the ultimate way to connect with others. Through using your time and talents to serve others you can gain many benefits, both tangible and intangible. You gain valuable work experience, learn new skills, earn job references, have opportunities to explore career possibilities, improve communication skills, earn academic credit, and broaden your personal and professional networks. In addition to this, the intangible benefits you can gain are endless. You will increase your understanding of your communities and the people in them and you will begin to feel that you are truly making a difference in the lives of others. 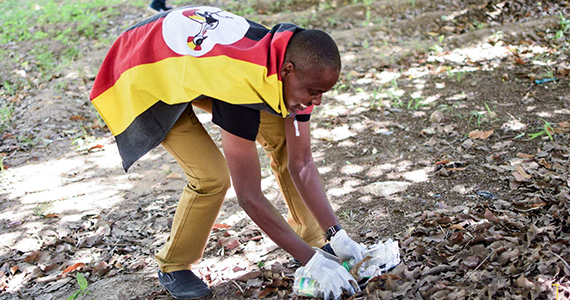 Whatever it is that you are looking for in your volunteering experience, Rotaract is a great place to use your gifts and talents. Contact a Rotaract club near you.